The teaser of Arvind Swami starrer Naragasooran will be released on November 25. Are you a fan of the suave and versatile Arvind Swami? If yes, then get ready to rejoice as we have some awesome news for you. 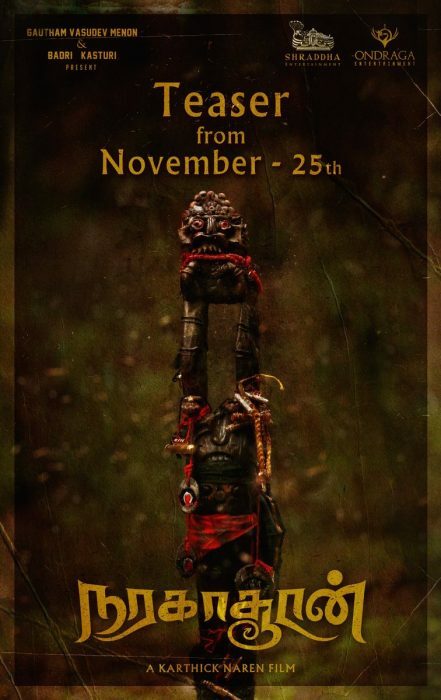 In an exciting development, the makers of his eagerly-awaited ‘Naragasooran’ have confirmed that the film’s teaser will be released on November 25. ‘Naragasooran’ is an adventure-thriller and has been directed by Karthik Naren. The director made his debut last year with ‘Dhuruvangal Pathinaaru’ which did well at the box office. As such, fans are bound to have high expectations from this one. Besides Swami, ‘Naragasooran also features Shriya Saran and ‘bilingual hero’ Sundeep Kishan in the lead. Shriya’s chemistry with the ‘Roja’ star has already created a buzz amongst fans and could turn out to be a major highlight of the film. Interestingly, Sundeep Kishan’s role was originally offered to Telugu star Naga Chaitanya. However, Chay was forced to opt out of the film because of his busy schedule. “He explained that he is busy with other commitments. We are still on good terms and would love to collaborate in the future,” Naren had said while talking about Chay’s exit. On a related note, this is a busy time for Swami. Besides ‘Naragasooran’, he has ‘Bhaskar Oru Rascal’ and ‘Sathuranga Vettai 2’ in his kitty. ‘Bhaskar Oru Rascal’ is a comedy-drama and also has Amala Paul in the lead. As far as ‘Sathuranga Vettai 2’ is concerned, it is an action-thriller and will see him share screen space with Trisha. So, are you looking forward to ‘Naragasooran’? Tell us in the space below.